When you come for treatments the first thing we do is have you take a visual field scan and then we check your visual acuity for distance and detail. This shows us where the damage is in your retina and where your vision is currently at. After that the doctor will design a treatment plan for you. You will then get on a table and get as comfortable as you can in preparation for the treatment. You will have 4 to 7 needles inserted in each foot and 2 to 3 in each hand only, and they will be placed accordingly with your results of the exams. Under NO CIRCUMSTANCES are any needles placed in or around the eyes. The needles are left in for about 20 minutes, then removed so the MicroAcupuncture points can recharge themselves. The procedure will be repeated with 1 hour intervals. 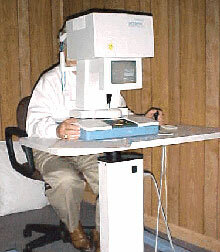 After 7 to 10 treatments, a second vision field scan and acuity test will be preformed and the comparison of these scans will show the effect of the treatment. When improvement is noted you can continue the program, and your vision will slowly regenerate while continuing treatments, you will have additional scans as you get treatments. The scanner is a computer controlled device that generates small lights in different sizes and brightness. They start out big and bright then depending on your response, they will get smaller and dimmer, the scanner will register the smallest stimulant you are able to see. The scanner we use will check the central 30 degrees of your vision and will create a color print out for easy interpretation and comparison showing your progress. The first thing you will notice is that your vision looks brighter. Some may notice that if they look at the near reading chart, they see smaller letters more accurately than they did 2 to 3 treatments earlier. If you have macular degeneration problems, you will notice that you can see smaller details like facial features more clearly. In cases of retinitis pigmentosa, glaucoma, and diabetic retinopathy, patients may get the feeling of their vision widening. On the third day of treatment you will get a second vision field scanning, at which point we can see the improvement in light sensitivity and acuity. This will provide information on how fast you are improving with the treatment. Then you can plan for your future treatments and gain an estimated time frame of how quickly you may regain your vison. If you have not been able to read for many years then it will take time before you are able to read again. Reading vision is about 20/50 and if you come with an acuity of 20/800 or worse, improve to 20/400 or 20/200, you can still not read but you have improved greatly. Of course with more treatments you can regain your reading ability fully. If you have improvement in your peripheral vision, you may not notice an improvement in your reading acuity. The Important of vitamins and minerals. When you are losing vision, the first thing you need to do is look at the nutrition you are receiving. Most people eat the same cereal every morning, get the same lunch, and not much variations in the their dinners either. Cereals are mostly carbohydrates. Lunch more often than not will contain a lot of fat and salt and have been over cooked reducing vitamins contained within. If you go out for dinner, it is possible to find restaurants that are health conscious, that do not contain dishes with high salt and sugar content. Most of the food we buy today is of poor nutritional quality, some vegetables have never seen soil but are grown in mineral wool (insulation material) and watered with a few nutrients, so they will grow nice and big with the least amount of labor. They also might have been grown in the same fields for the last 100 years, without adding trace minerals to the fields resulting in depletions of minerals in the food we buy. That is why it is important to get good supplements. Some supplements sold in stores in some cases can be just as bad as the food in the market. You can see what is contained within the supplements by looking on the label of the bottle. On a personal account, we were once offered the vitamins we sell, from another manufacturer, for less than we pay for the Lutein in our vitamins. The representative left some sample bottles that according to its labels contained the same amount of vitamins and minerals as what is sold at our office. We sent a sample off to a laboratory to see what was in them and how much of what was contained within. The results came back as the whole bottle (200 capsules) having the same amount of vitamins and minerals we had in 8 capsules of our own supplements. You can buy vitamins containing very small amounts of Vit-A, Vit-C, Vit-E, Zink, Selenium, Copper and Lutein, that are labeled as "complete eye vitamins." Due to these small amount of supplements contained within these "complete eye vitamins," to get the required minimum amount needed to maintain healthy eyes, you will run out of these vitamins in roughly 5 days; contrary to the bottle saying it will last for 30 days. When taking vitamins always take a complete multi-vitamin with added vitamins and minerals for the specific treatment of your illness you are looking to cure. It does not matter what kind of supplement you are taking, it will not by itself improve your visions. At best change it will slow down the deterioration of your vision. In best case scenarios it may maintain vison quality between treatments. Patients who have discontinued use of vitamin supplement usually end up having to come back earlier to receive treatments.